Washington Capitals captain Alex Ovechkin has long been criticized for failing to get it done in the playoffs. Year after year, the Russian has seen his season cut short (primarily by Sidney Crosby and the Pittsburgh Penguins) despite regularly leading the Caps to the top of the Eastern Conference standings. The 2018 playoffs have told a different story, as Ovy has managed to lead Washington to its first Stanley Cup since 1998. Their recent success hasn’t stopped a Las Vegas restaurant from poking fun at him, though. 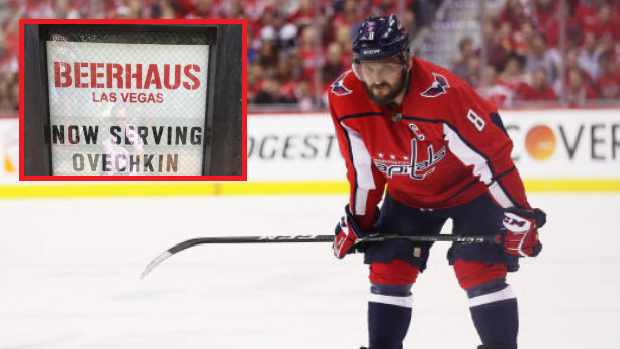 ‘Beerhaus’ restaurant is offering an ‘Ovechkin Special’; a White Russian with no Cup. This wasn’t the first time Beerhaus has roasted their opponent. During the Golden Knights’ Western Conference Final tilt with the Winnipeg Jets, they made sure to take a shot at them by cleverly using their goaltender’s name. They also felt the need to take a small shot at Winnipeg's name. Beerhaus unsurprisingly wasn’t the first establishment to make a White Russian joke about Ovechkin. A local Pittsburgh bar made sure to do the same after the Penguins knocked off the Caps last year. This likely won’t be the last time Ovechkin will be publicly roasted before the series’ end.